​The Society of St. Vincent de Paul was established in 1833 by Frederic Ozanam, a young Catholic man who formed a “Conference of Charity” with his peers to serve the sick and dying in post-revolutionary Paris. 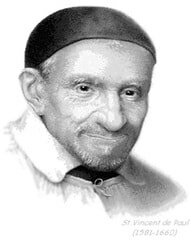 Under the Patronage of St. Vincent de Paul, Patron Saint of Charity who faithfully served the poor, the “Conference of Charity” visited the poor in their homes, providing them with needed aid and assistance. This mission continues today in our own community. At the Old Cathedral in St. Paul, Bishop Joseph Cretin founded the St. Joseph Conference of the St. Vincent de Paul Society in 1856. The Society opened its first thrift store in Minnesota in 1895 on Wabasha Street. Today, the Society of St. Vincent de Paul remains the oldest nonprofit organization in Minnesota and continues to faithfully serve brothers and sister in need. For more info about the National Society, please visit http://www.svdpusa.org/About-Us/History. Born to the French peasant class, Vincent de Paul found the priesthood a way to help support his impoverished family. After ordination, he served as a tutor and chaplain to France’s wealthiest families, including the royal court, for many years. A false allegation of theft lost Vincent everything; his reputation, his influence, his power—everything he thought important. After a four year crisis in faith and an eventual revelation of God’s compassion, Vincent’s true life mission was revealed in the confession of a poor dying peasant. Vincent was struck with the reality that had he not been there, the man would have died not knowing there was a God who loved him. Slowly, Vincent was being led to the poor, to the very place from which he spent so many years running. Vincent de Paul faithfully served the poor for 43 years: the refugees, the beggars, the sick and the dying and orphans. Vincent de Paul died in 1660. He is today the Church’s Universal Patron Saint of Charity. Frederic Ozanam learned compassion at an early age. Typhus ravaged the Ozanam family of Milan, Italy and claimed 8 of 9 children. As the only survivor, Frederic witnessed his mother and father (who was a doctor) tirelessly tend to the sick and dying during this most horrible period. Post revolutionary Paris, where Frederic attended the Sorbonne, was openly hostile to anything Catholic or Christian. During a student meeting, revolutionaries issued a challenge: “(Christianity) may have been useful in the past, but what use is it today? What has Christianity to offer? Where are its works now? Show us your works!” Ozanam's reaction was immediate. Within weeks, Ozanam, at 20 years of age, and six of his peers formed the first "Conference of Charity." Under the conference, this group of seven men financed their works of charity out of their own pockets and from contributions of friends. They visited the poor in their homes, providing them with needed aid and assistance. Ozanam soon after placed the conference under the patronage of St. Vincent de Paul who had spent his life in 16th century France serving the poor.